So if you read this post, you know that I LOVE the show Shark Tank! Watching other entrepreneurs find success in their chosen fields, and seeing what creative risks they've taken and choices they've made, really gets me motivated! If you read about my goals for 2018, you know that this year is all about growing as a business owner! As a result, my reading queue has been largely business self-help books lately! If you've ever tried to find a good business self-help book to read, you probably know how hard it is to find what you're looking for--there is SO MUCH out there! Books cover everything from running a startup, to marketing tips, to how to be more assertive at your current job, or how to get along with coworkers. I was watching a YouTube video of Daymond discussing business advice with a TV interviewer, when his description of this book caught my attention. He explained that often, not having a huge budget can be good for startups--when you don't have tons of money to rely on, you have to think of really creative solutions to every problem you face, which often results in innovative new techniques. Well, everyone who knows me knows that I live my life on a super tight budget--writing doesn't pay all that much! I used about $7,000 to start up The Furever Home Friends, all of which I raised through pre-orders on Kickstarter. That was an absolutely bare-bones budget to cover the non-negotiable expenses--illustrations, book printing, etc. It left no room for a marketing budget or anything like that. Since I don't have much personal income to invest into my business, I thought Daymond's advice could be really useful to me. I LOVED this book! His writing style was conversational and easy to follow. He wove in a lot of his personal experiences, and it was interesting to learn about his life--he's basically been starting businesses and finding ways to make money since he was a teenager. The book also includes stories of different entrepreneurs, in a variety of fields, who have used lots of different techniques when getting their businesses off the ground. The one thing they had in common, though, was that they didn't have major budgets to spend on their businesses, and they all had to think outside the box to market themselves differently. I read this book on a plane, and parts of it got me so inspired that I had to put the little tray-table down so I could start writing all the new Furever Home Friends sales and marketing ideas that were coming to mind. If you're new to business and not independently wealthy, I highly recommend this book! 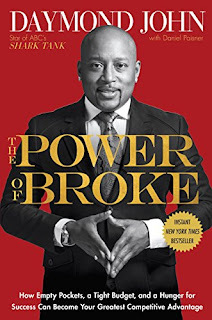 I have pre-ordered Daymond's new book, Rise and Grind. In the meantime, I'll be finishing up five other business self-help books I'm reading! Stay tuned for more reviews and recommendations!